How are we already in the middle of October? I swear I sometimes have no idea where the hours go. I need things to slow down a bit. The weather has been so dreary all I want to do is hibernate under the bed covers. Wouldn’t that be fun? For a day or two. With the cold slowly moving in, I’ve been loving warm breakfasts lately. I still usually have a banana with coffee in the morning, which you all know, because I can’t seem to talk about breakfast without mentioning this. But it’s true. Although lately I’ve been either having oatmeal with lots of cinnamon and a chopped banana or warm smoothies with a banana blended in there. Do you have a favorite fall/winter breakfast? I normally prefer quick things during the week, so yogurt is always a nice option, especially when loaded with oats or nuts, and so are overnight oats, but I’ve been trying to give myself more time for breakfast lately. I think I do this every year. I create a routine, I break it, I go back to it, I forget about it again… I’m trying to get back to it, to warm breakfasts. Anyway, today’s choice is this creamy oatmeal apple smoothie. It’s really similar to this very old recipe and I feel like a crook for giving you a similar one, but I just can’t help myself. I think this smoothie today can be called Total comfort smoothie 2.0. An improved version. We’re fans of improvement, right? Sidenote to the linked recipe: I now have too many glasses. Welp. The process starts by soaking hazelnuts and dates in hot milk. You can totally skip this step if you’re in a hurry, but I think the soaking helps develop the flavors more. 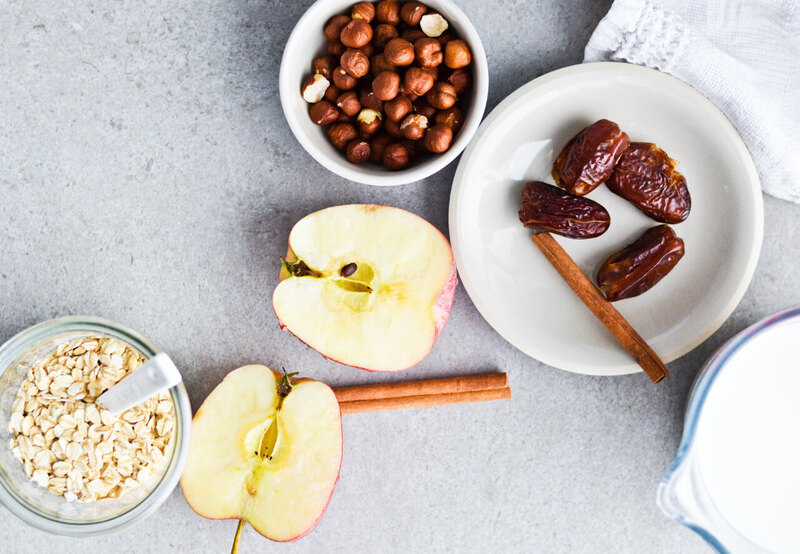 Dates add some sweetness and warmth, but I absolutely love the combination of hazelnuts and apples. I usually reach for macadamia, but I think hazelnuts are much more autumnal and work better in this recipe. You can use other nuts if you wish, but for me walnuts or pecans seem too strong while something like cashews are too bland and peanuts are too peanutty. I know that’s not a word but peanuts, while amazing, have a very distinct flavor and unless you’re going for a peanut butter vibe, I really wouldn’t use them. But really, try hazelnuts. They have such a delicate flavor, slightly nutty and sweet, just what this season calls for. The oats are another must. 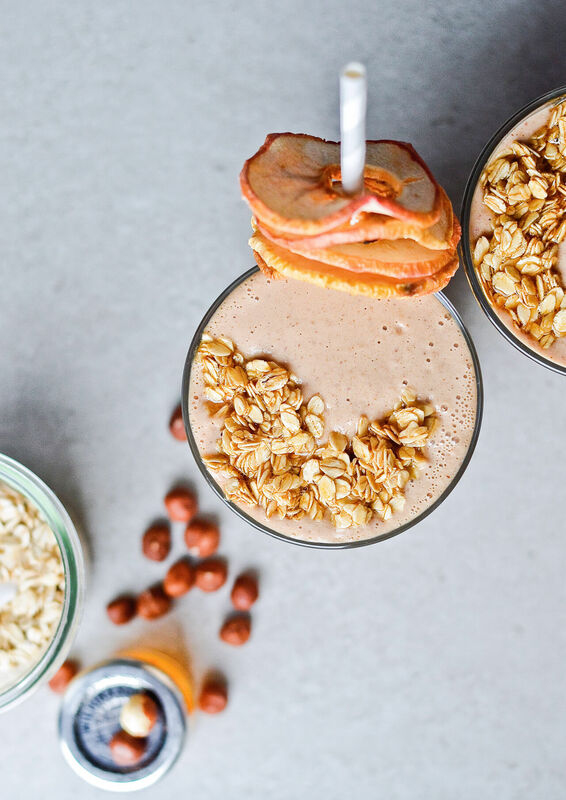 I love sneaking oats in smoothies. 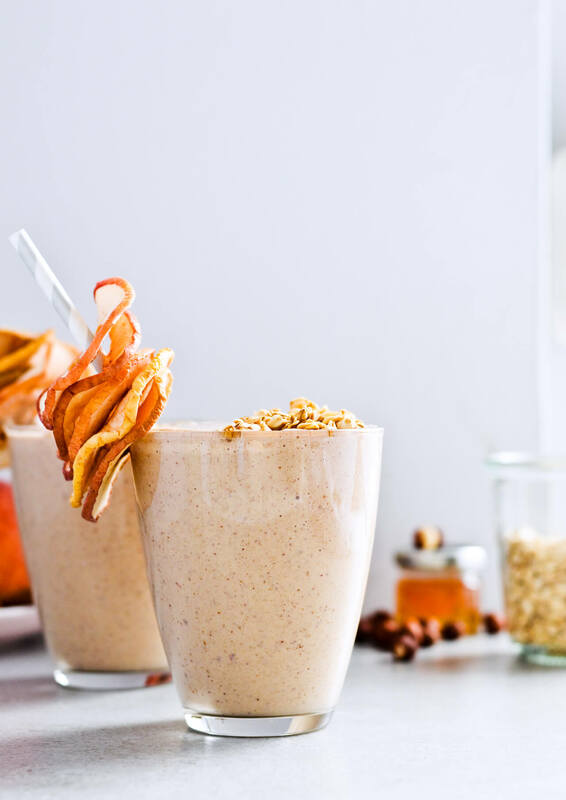 You blend them first and they do add some texture to the smoothie, but you hardly notice them and they’re so good for you, filling and full of fiber. As for the fruit I add both apples and bananas. Know that this recipe can easily serve two, so you can always leave some of the fruit out, if you’re making this just for one person. 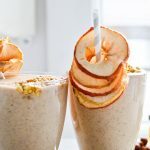 Basically, if you want a cross between an apple crisp and apple pie, but healthy and in breakfast / snack form, you need to make this creamy oatmeal apple smoothie. It’s cozy and filling and just perfect for this season. 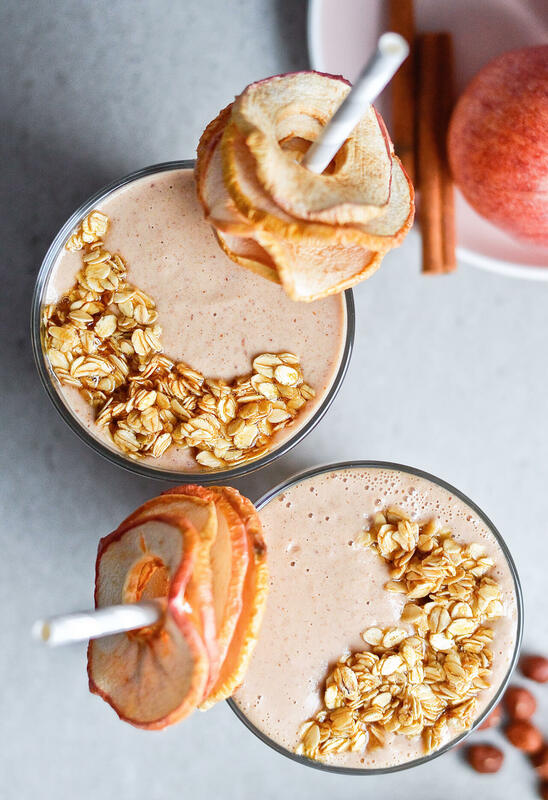 Apple pie in healthy breakfast form! Bring milk to a light simmer in a heavy saucepan OR warm it up in the microwave. You want it hot, but not boiling. Transfer to a pitcher or bowl, add the dates and hazelnuts and let them soak like this for about 15-20 minutes. Transfer oats to your blender. 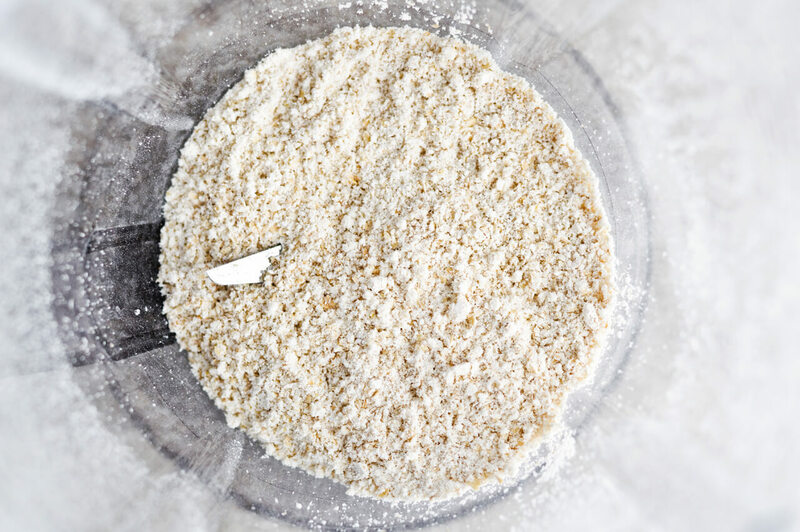 Blend on high until they resemble coarse flour. Add the dates, hazelnuts and milk and keep blending until smooth. Add the apples, banana, cinnamon and honey and keep blending until completely pureed and smooth. Taste and check the consistency, see if you need more milk or maybe more honey. Divide smoothie between two glasses (if making this for two). 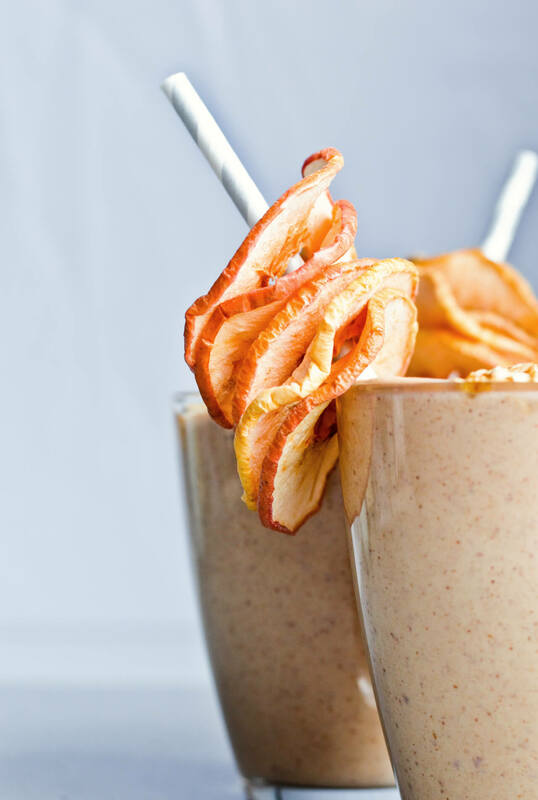 Add a straw with apple chips to each one. 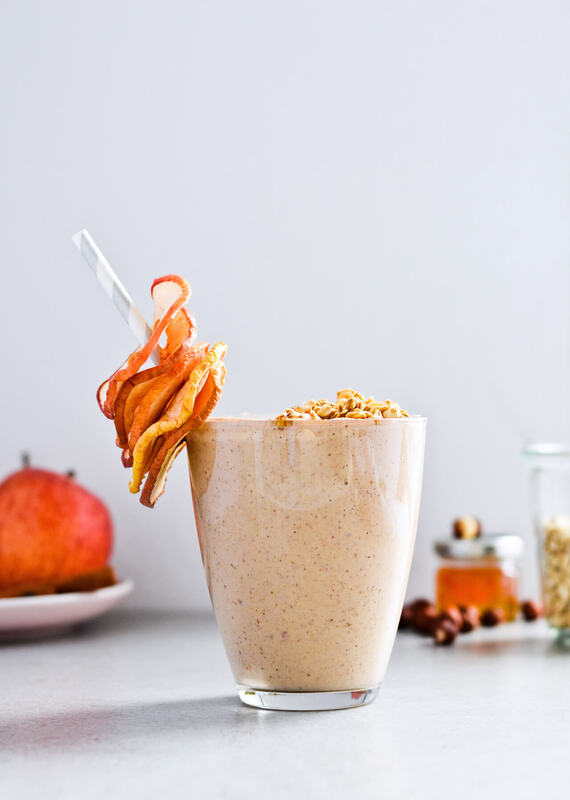 Lastly, in a bowl, stir together the oats and honey and top the smoothies with this. Serve. 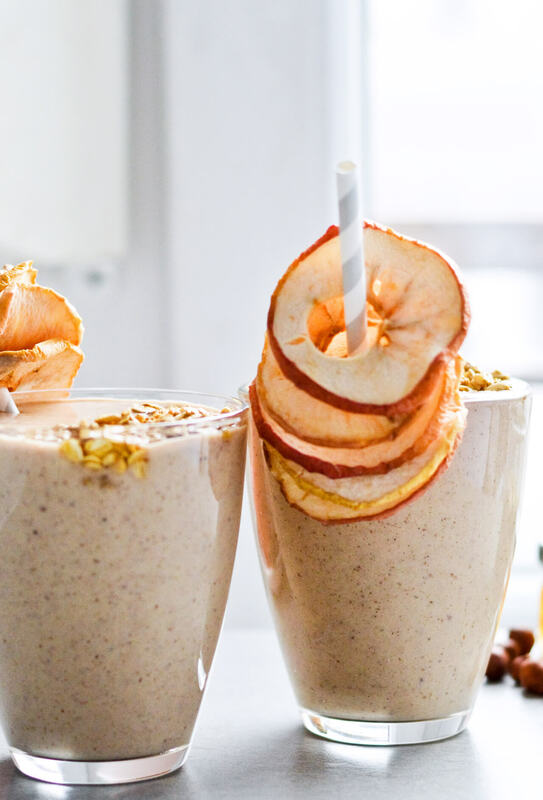 For a smaller smoothie, leave out one apple or the banana. You don’t have to soak the dates and hazelnuts, if you’re in a hurry, but they do blend a lot easier when soaked.